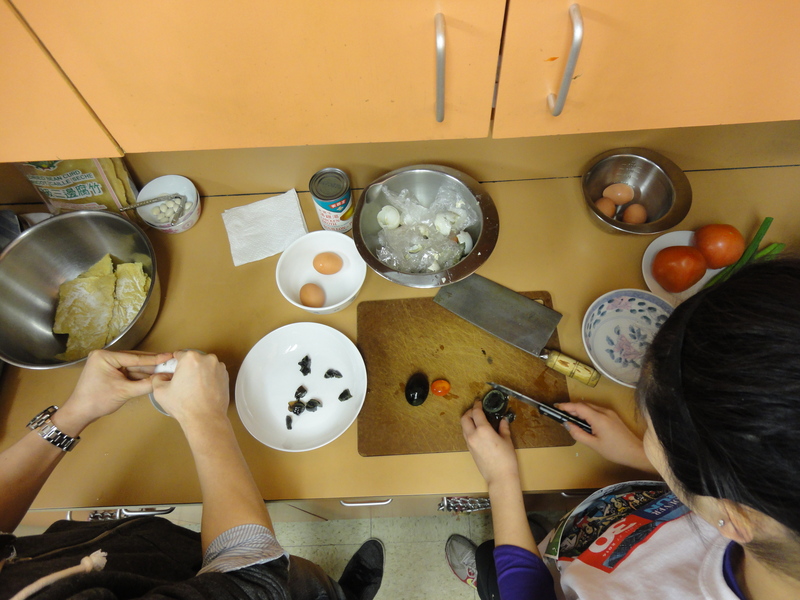 It’s been a while since our first cooking class in November but we thought we’d wait until the holiday season(s) were over (Christmas, New Year’s, Lunar New Year, Clan Association Spring Banquets and Chingming) and the commotion settled down before we started another class. This time around, we focused on the theme of eggs – quick, accessible and cheap. We made a simple homemade meal consisting of 2 dishes and a dessert. See the recipes and pictures below. If you try any of the dishes at home, please let us know how you did! If it doesn’t taste right, let us know and we can do some “troubleshooting”! 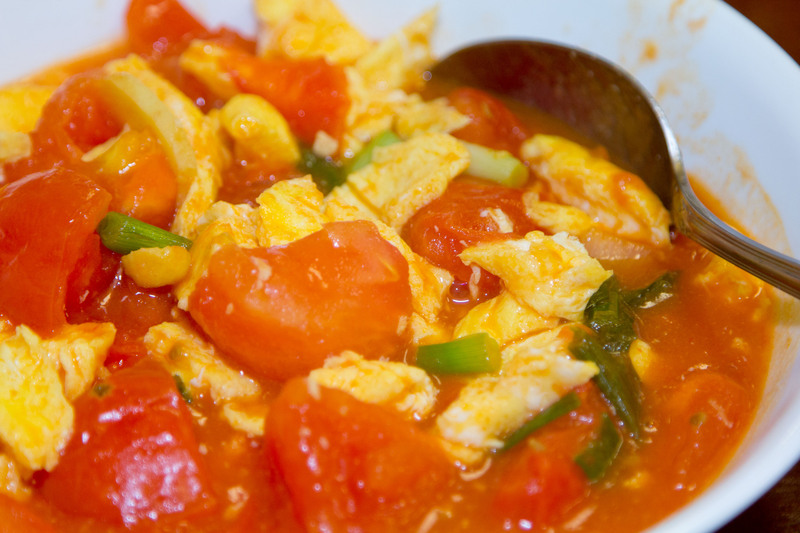 RECIPE #1 Tomato Cooked Egg – The sweet and sour flavours of this saucy dish make it appetizing and great to accompany rice (soong faan). A simple, fast dinner that kids love. In the absence of a wok, we used a frying pan, which also works. Whisk eggs with ¼ tsp salt and optional ¼ tsp chicken bouillon powder. Heat canola oil (about 1 Tbsp) in wok or large frying pan on high. (The key to cooking great eggs is to make sure your pan/wok is hot before you pour in the eggs. To test if it’s hot enough, you can flick a couple drops of water onto the pan or put the end of your egg covered chopstick on the pan. If the water or egg sizzles, it’s ready) Pour in egg mix and cook as you would scrambled eggs until just barely cooked through, being careful not to overcook. Remove to your serving dish. Give the pan a quick clean if needed and return to high heat. Add canola oil (about 1 Tbsp) and when hot, add ginger and green onion and let them sear for a few seconds. 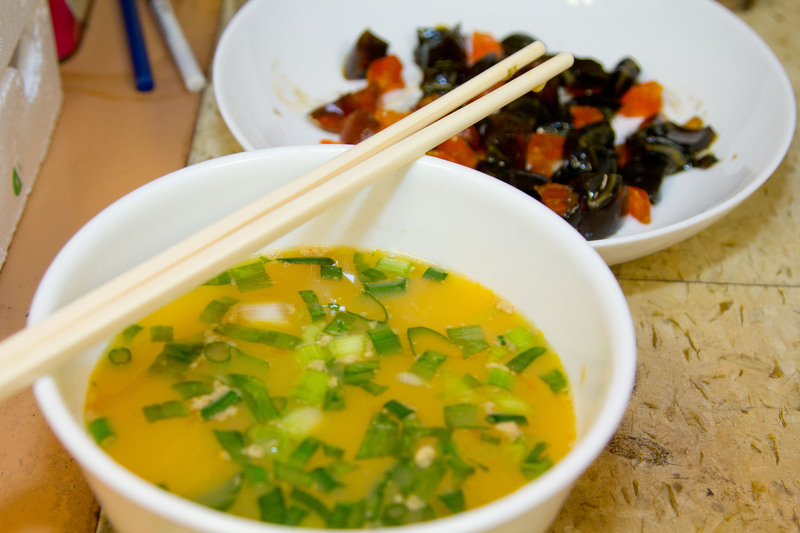 This is where lots of the flavour comes in – the “wok hay”. 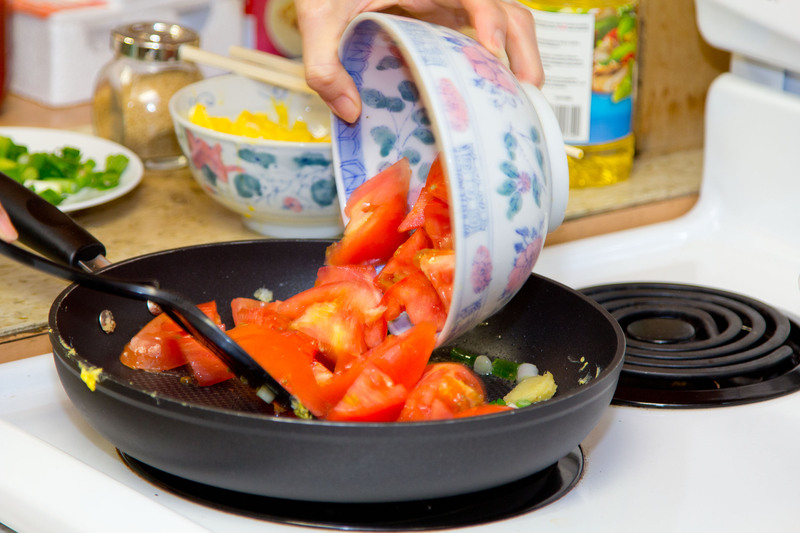 Add cubed tomatoes and ¼ tsp salt and stir in pan for 1 minute. Add sugar and ketchup and stir to combine flavours, for 1 minute. Add water. Cover and lower heat to medium-high, simmering for 2 minutes to break down the tomatoes. Prepare cornstarch with a little water in a small bowl making sure the cornstarch is dissolved, not settled on the bottom. 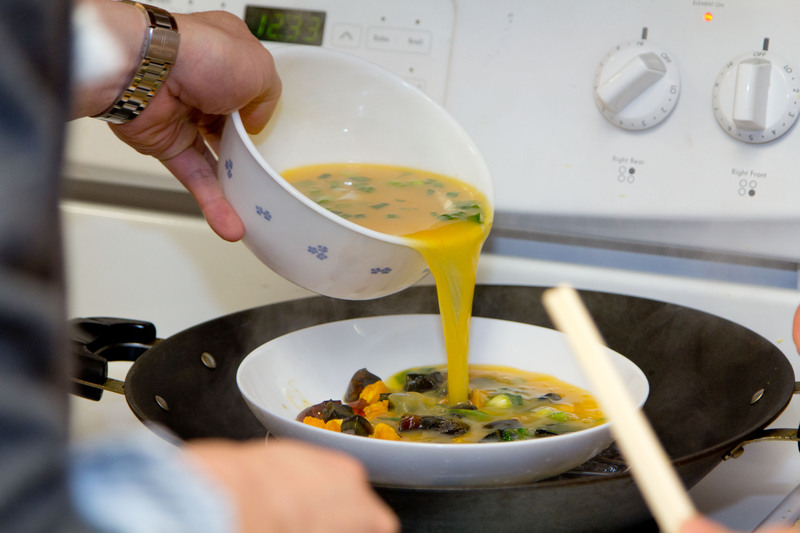 Uncover and stir in reserved eggs, breaking them up a bit with your wok chaan. Slowly mix in cornstarch to thicken and create a sauce. This is called “da heen” which is to make a thick sauce. Make sure it is evenly mixed through. Serve with rice and lots of sauce! RECIPE #2 Steamed Egg Trio 蒸三色蛋 – A great contrast of comforting flavours and textures across the three types of eggs in this dish. The saltiness of the ducks eggs make it great to soong faan too. 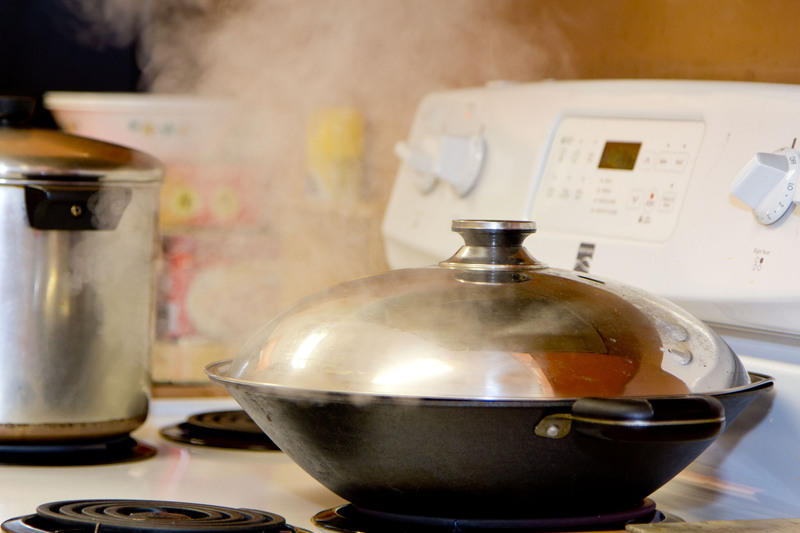 – Steaming apparatus: My mom uses a wide, flat-bottomed wok with a metal wire steam rack stand and about 4 cups of water. Too much and the water may boil over into the plate, too little and the wok may dry out. Spread out chopped century eggs and duck egg yolks in deep plate. Bring steamer to boil at maximum heat. Add plate of century and duck eggs. Steam with the wok lid on for 5 minutes. In medium bowl, combine duck egg whites, chicken eggs, chicken stock and green onion. Beat together well. 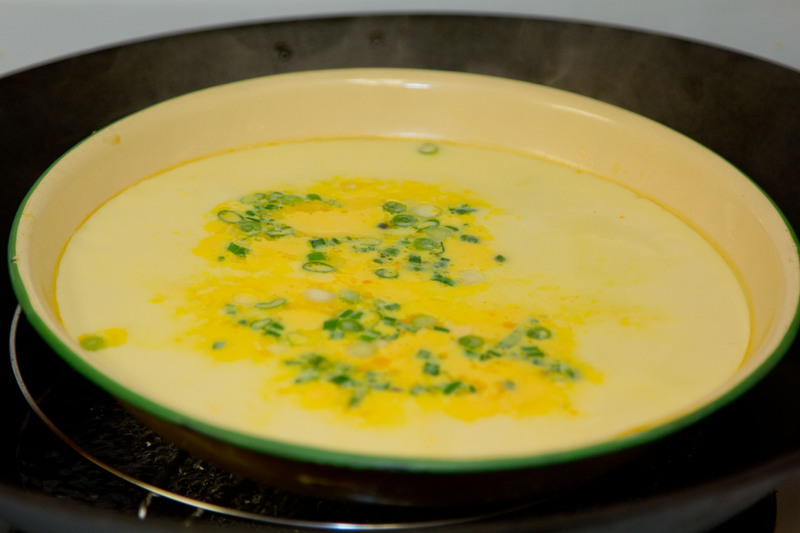 Once the 5 minutes are up, uncover the steamer and slowly pour the egg mix into plate. Cover carefully with a flat plate turned upside-down. This will ensure a smooth surface in the end. Cover the steamer and steam for 15 minutes. Uncover steamer and flat plate and check to see if the eggs have set. Eggs should be springy. If still wet/wobbly, steam for 5 minutes further. Remove dish from steamer. Finish by drizzling olive oil and soy sauce over top. 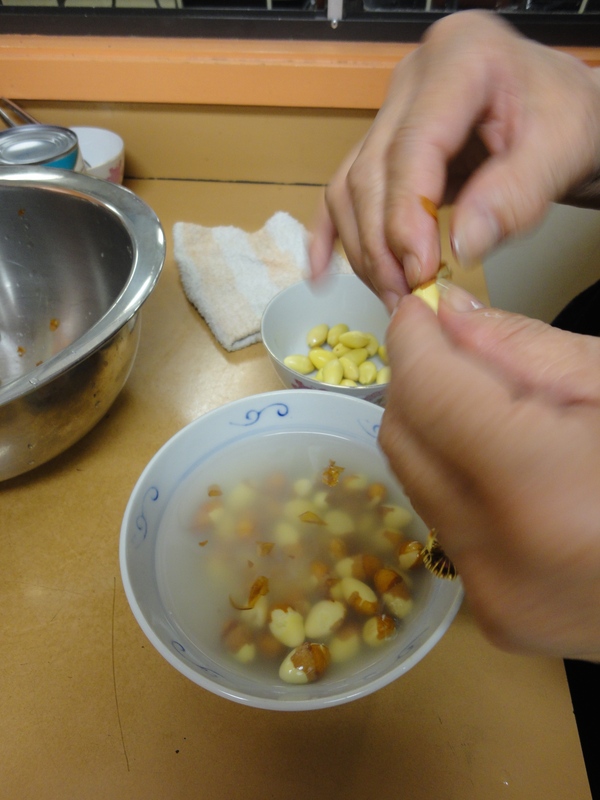 RECIPE #3 Dried Beancurd and Ginkgo Nuts Dessert 白果腐竹雞蛋糖水 – A personal favourite of mine, an easy and refreshing dessert that can be served hot or cold. 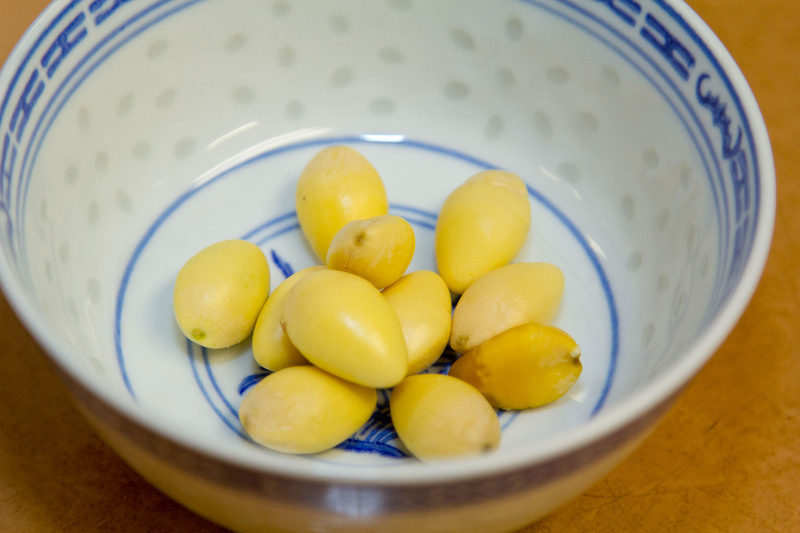 Vacuum-packed, pre-shelled ginkgo nuts can be used, but are not nearly as fresh/fragrant/fun as peeling your own. Once shelled, soaking in a little hot water makes it easier to peel off the brown inner skin. Bring water to boil in a large pot. Add ginger, sugar and gingko nuts. Turn stove to medium-low and simmer covered for 15 minutes. 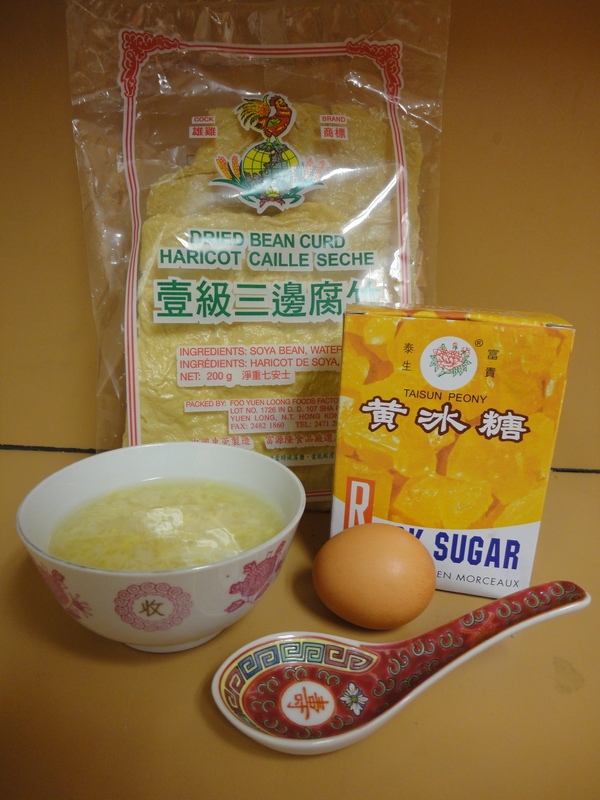 Soak dried beancurd in a bowl with cold water for 15 minutes to soften, with optional 2 tsp salt to prevent the beancurd from breaking up too much. Rinse and drain in a sieve. Add beancurd to pot. Turn heat to medium-high and cook partially covered for 15 minutes until beancurd breaks into pieces. Watch the pot as it will easily boil over at this stage. Add eggs according to your preference. 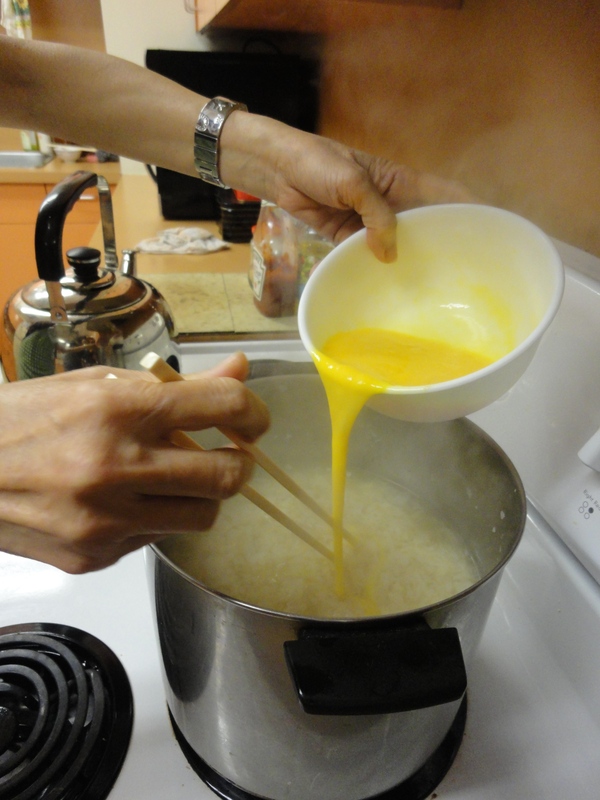 To create egg cloud, beat eggs in small bowl and add to pot in slow stream while stirring. For soft-boiled eggs, turn off the heat and break and add whole cooked eggs individually to the pot, letting the heat in the pot cook the eggs, for about 5 minutes. For hard-boiled eggs, cook eggs separately. Serve with ½ or 1 egg per person. 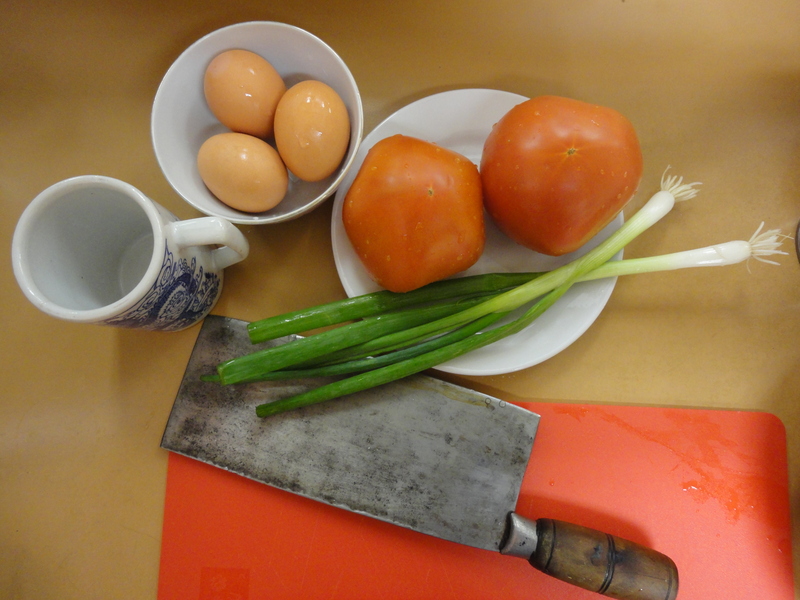 Are you interested in joining our cooking class? Is there a dish you would like to learn how to cook? Feel free to email me and we’ll try to find someone who can teach! We are thinking of holding these every 2 months and currently exploring the possibility of doing Zhong for our next session June 1st. Interested?? ?